From the day the Soviet shuttle program was shut down in 1992, both Western and especially Russian press has been running occasional stories about a possible revival of the majestic Energia rocket or even the winged Buran orbiter. It was mostly a reflection of wishful thinking of the project's veterans, yet in 2012, the Russian space agency endorsed a long-term plan potentially leading toward a super-heavy launcher. Not surprisingly, by the time the big rocket appeared on the horizon, Russian engineers had already had their sketches ready. Along with several other industry proposals, GKNPTs Khrunichev in Moscow, the manufacturer of the Proton rocket, drafted a pair of giant launchers designated Amur-5 and Yenisei-5. While Amur-5 was mostly a repackaged version of the Angara-100 design proposed back in 2005, Yenisei-5 featured a radically different approach. The concept was formulated as early as 2008. Standing 75 meters tall, Yenisei-5 would use a core stage powered by three hydrogen-fed RD-0120 engines, which GKNPTs Khrunichev argued could be revived after the demise of the Energia rocket in the 1990s. Four RD-0120 engines propelled Energia's core stage. The use of liquid hydrogen on the core stage as oppose to kerosene fuel would sharply increase the capability of the proposed launch vehicle, enabling it to deliver 125 tons to the low Earth orbit. The payloads to be sent beyond the initial low Earth orbit would be further increased by the use of hydrogen on a proposed space tug dubbed KVTK. It would serve as the third stage of the Yenisei-5 rocket. The Yenisei-5 launch vehicle would be based at the yet-to-be-built launch site in Vostochny in the Russian Far East and become a centerpiece of an ambitious space program, possibly supporting a base on the Moon and even expeditions to Mars. 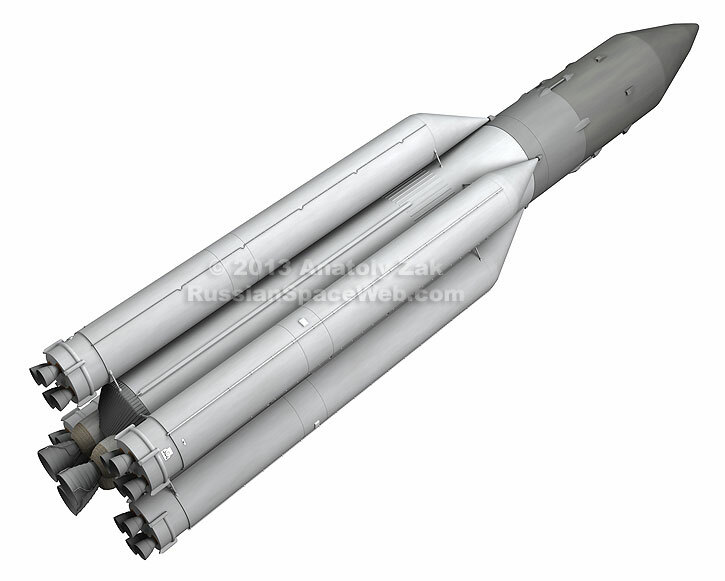 The central core stage on Yenisei-5 would ignite on the launch pad simultaneously with four kerosene-fueled strap-on boosters equipped with existing RD-170 engines. GKNPTs Khrunichev also promised that the diameter of the first stage modules would allow their transportation by rail. This claim was in contradiction with a quoted diameter of the first stage -- 4.1 meters. 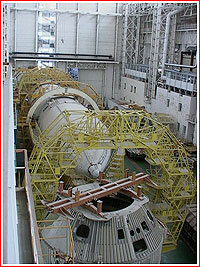 Although GKNPTs Khrunichev routinely transports Proton stages of that diameter to Baikonur launch site, such trip to the Russian Far East would probably be impossible without major re-building of railway lines, tunnels and other infrastructure, as well as stopping and diverting head-on traffic -- hardly a realistic option. It was a key reason why the diameter of the cancelled Rus-M rocket was restricted to 3.8 meters. GKNPTs Khrunichev was not the first company to propose reviving the technology and architecture of the Energia rocket, which could deliver around 100 tons to the low Earth orbit. During the 2007-2008, RKK Energia also studied a configuration closely resembling the legendary vehicle, which differed from its Soviet predecessor by the placement of the payload section at the top of the rocket, rather than in a side-mounted container. However, at the time, the company's planners ultimately decided to limit their even most ambitious plans by payloads not exceeding 60 tons. Yet in 2012, the Russian space agency, Roskosmos, appeared to endorse GKNPTs Khrunichev's proposals, at least in its long-term paper plans. In December, Gennady Raikunov, the head of TsNIIMash research institute responsible for long-term strategy of the Russian space program, told the Interfax-AVN news agency, that the first launch of the super-heavy rocket based on Amur and Yenisei designs would take place from Vostochny in 2028. The implementation of such a program would require huge investments. 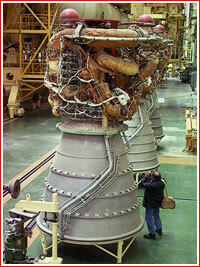 According to many Russian rocket propulsion experts, the RD-0120 engine would have to be developed essentially from scratch, as most of its critical infrastructure was no longer existing. The rocket would also need a monumental new launch facility. Serious logistical challenges to transporting large-diameter core stage or its components from the factory to the launch site would have to be addressed. Since traditional Russian method of transporting rockets by rail would not be an option, a large transport aircraft and associated facilities would have to be developed. Still, proponents of hydrogen propulsion argued that Russia, like any other space-faring nation, would have no alternative to the ultimate rocket fuel.